And it starts... Closed Beta is here! The time has finally come and we have started Closed Beta! You can read the official press release about it here or you put in a beta application here. 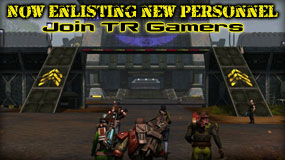 "I have to say, from my first day in TR yesterday I'm VERY impressed. There are some glitches and problems here and there but hey, this is polished for a beta game. What I enjoy most, is how you've somehow pulled my thoughts away from XP, Leveling and grinding. Instead of being faced with a field full of large rats and being told that i have to kill something in the order of 200 of these buggers before I get my gold chalice, I'm dumped into the middle of a very real war for my own life. I'm sitting at a checkpoint at the outskirts of our camp, looking over my skills, when I hear a yell and gunfire. I pull out of my menu to see the bane breaking down the friggin door! I jump behind some sandbags and start firing like crazy with my rifle. After a couple minutes of frenzied fighting the battle is over, the bane are dead, and I'm wiping the sweat off my brow. Hey look, i got xp for that, sweet! I really like how one forgets entirely about their xp bar and genuinely wants to kill off bane for the fun of it. I just grab my trusty rifle sometimes and head off toward the nearest bane stronghold to light up a few dozen of them for no other reason other than how fun it is. Thats what most MMOs lack today, they tell you that you must kill a lot of critters to level up. While in this one, you have a very real enemy that seems to have something personal against YOU, gives you a rifle, and tells you to go kill em all. Great job guys! This is going to turn out to be one kickin game. " Screenshot of the Week, It’s Electrifying! Arieki rain trees surround an AFS soldier as she prepares for battle. She is wielding an electric staff in this weeks screenshot. Have a crazy, funny or maybe wild emote that you think TR should have? 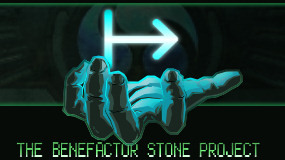 How is your chance to see it in game with the latest Tabula Rasa contest! 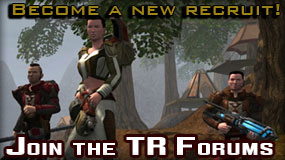 Think you have a compelling emote that you and everyone else could use in Tabula Rasa? Great—now's the time to strut your stuff, because we want you to send in a video of it with our new Emote Contest. Check out our Contests page for more details. NCsoft North America, the U.S. branch of NCsoft, the world’s largest independent developer and publisher of online computer games is seeking a talented Web Content Writer/Community Liaison. The Web Content Writer/Community Liaison will join a team of people working on public NCsoft MMO game web sites that strive to both entice and inform game players about our virtual worlds. This person is responsible for quickly converting content into web pages, and posting them to the appropriate sections of the web site. If you have written player guides, strategy guides, or created intricate stats tables for no good reason other than to help your fellow gamers, you are one of us and we would love to see your work. Visit HERE to review the job requirements and learn how to apply. Screenshot of the Week, I Shall Call Him Mini-Me! In this weeks screenshot, a Top Secret Ranger known only as N.F. is shown using his Summon Reinforcements Logos ability. The ability allows the Ranger to summon an ally of varying types depending on how the player has specialized. Multiple allies can be summoned. 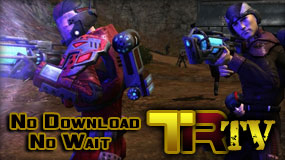 The first newsletter in a long time has hit the inbox's of TR fans everywhere. If you missed this e-mail, make sure to check your e-mail settings and/or check to make sure you have an updated address at PlayTR.com. Future Tabula Rasa Beta testers! I want to thank you for your interest in Tabula Rasa. I am extremely excited about the progress that has occurred over the recent months and I can’t wait for you to get in and test it out yourselves! Tabula Rasa is still in its “Friends & Family” Beta phase, but it will be entering Closed Beta within the next several weeks. Once Closed Beta has begun, alerts will go out to small groups of players from this list. This will occur in waves, so I ask that you please be patient. In the mean time, if you haven’t read about the game’s recent progress, I invite you to check out some of the press here or see the latest gameplay movie from GDC here. Additionally, there is a contest currently running based on the new language that I created for the game called Logos. You can learn more about the language and your chance at having an NPC named after you here. Thanks again for your interest and I hope to contact you very soon! Screenshot of the Week, Not in Kansas Anymore! Tabula Rasa is not all happy trees and forests. Some alien worlds are hostle. Fresh off the dropship in Arieki, we see this week's screenshot of the Arieki sky. Screenshot of the Week, Can’t Touch This! 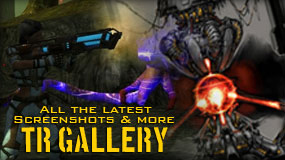 This weeks screenshot shows the FX of a firing Net Gun. You see the net as it travels toward the target, and if you look carefully, you can see how a previous round has ensnared the target and is rooting him to the ground. The Benefactor Language Research Project (BLRP) has successfully translated 2 new logos! Screenshot of the Week, Intel is Key! Good intel is the key to victory! Cameras located in bases and in battlefield control areas let players determine enemy count and command squads from remote. They can also be helpful in strategic planning. You can see one here in this weeks screenshot.